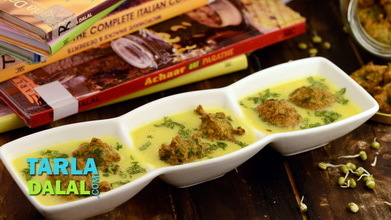 Gattas or gatte are gram flour dumplings that are spiced up with dry masalas and then steamed and cut into small bite sized pieces. 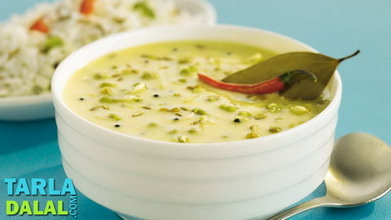 They are used to make a wide variety of dishes like subji, pulao etc. 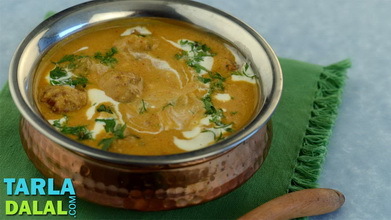 This dish is made using a yoghurt based gravy and dry masalas to create a mouth-watering recipe that will complement both rice and parathas. 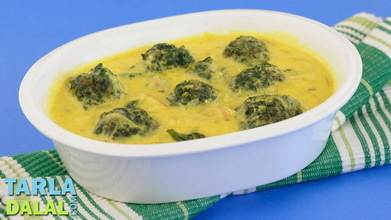 Another version of the Gatte ki Kadhi is made using an onion and tomato based gravy is usually prepared in the winter when vegetables are easily available. Combine all the ingredients in a deep bowl and knead into a stiff dough using 1½ tbsp of water. Divide the mixture into 8 equal portions and shape each portion into a 200 mm. (8") long thin cylindrical roll. Cut the gattas into 10 to 12 equal pieces and keep aside. Boil plenty of water in a deep non-stick pan and cook the gattas in boiling water 7 to 8 minutes. Drain and keep aside. 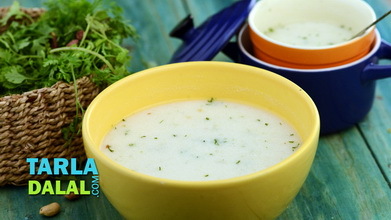 Combine the curds, besan and ½ cup of water in a deep bowl and mix well using a whisk so that no lumps remain. Heat the oil in a deep non-stick pan, add the cumin seeds, mustard seeds, fennel seeds, asafoetida, bayleaf, cardamom, clove and curry leaves and sauté on a medium flame for a few seconds. When the seeds crackle, add the turmeric powder, chilli powder and coriander-cumin seeds powder and sauté on a medium flame for 30 seconds. 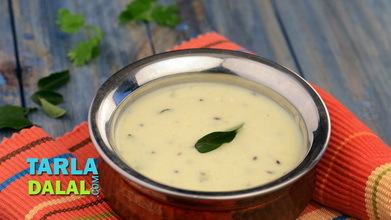 Add ½ cup of water, curds-besan mixture and salt, mix well and cook on a medium flame for 2 minutes, while stirring continuously. 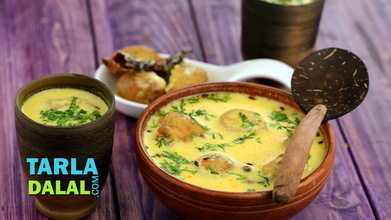 Just before serving, add the prepared gattas to the kadhi and cook on a medium flame for 2 minutes, while stirring occasionally. 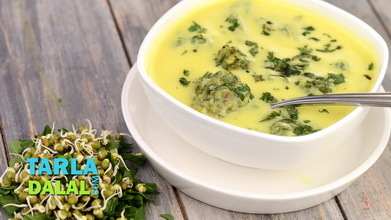 Serve hot garnished with coriander.